Centrally located in Düsseldorf, this hotel is set just a 10-minute walk from both the Königsallee shopping street and the Main Train Station. It offers modern-style rooms and free WiFi. 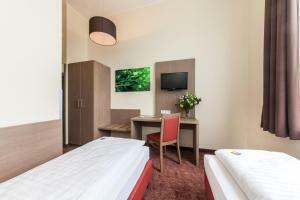 All rooms at Novum Hotel Maxim Düsseldorf City are decorated in a classic style, and feature a TV and a desk. Each room also includes a private bathroom with a hairdryer. Various dining opportunities can be found within 2 minutes’ walk of the hotel. A rich breakfast buffet is served every morning at Novum Hotel Maxim Düsseldorf City. Düsseldorf’s historic Old Town is 1 km away, while the Messe Trade Fair can be reached in 25 minutes by car or public transport. The hotel is 150 metres from the Fürstenplatz Tram Stop, and Düsseldorf Airport is 10 km away.